Job Search,job referral, job fairs, and job placement which may include counseling, assessment, and occupational and labor market information. Training - activities tied to work experience, internships, entrepreneurship, or job placement. 14 years of age or older at the time of employment in the program. If male, be in compliance with the U.S. Selective Service System registration requirements. Grant staff will determine eligibility, maintain records of each individual served under the grant award prior to enrollment in the program, and report that individuals meet the eligibility requirements per the reporting requirements of the grant contract. Find a Job! Post a Job! CareerLion is the NCTC job and internship portal for students, employers and alumni! Register online, view and register for events, post jobs & internships, search resumes and portfolios. 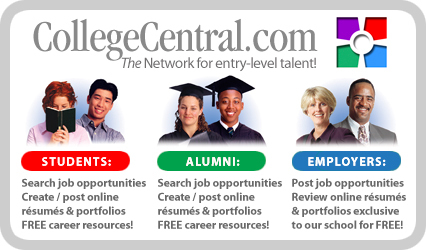 North Central Texas College uses College Central Network as it official job resource and resume system. Students, alumni, and employers easily create an account at CareerLion. Students, easily apply to jobs and Internships/Co-op job opportunities posted exclusively for you and search other opportunities via Job Central and Intern Central, national job boards. Employers search for talented students and alumni, and post unlimited jobs for free. Please reach out to us for more information.